Anna Renzenbrink, Amy Moule, and Merrilee McCoy are Spider Dance. 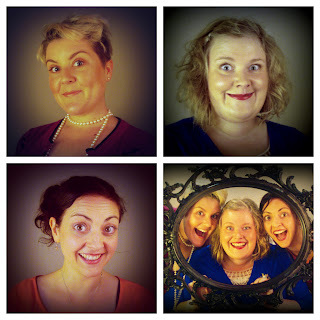 Sharing the stories your Mama was afraid to tell you, and your Auntie Em tried to forget, these funny ladies expertly merge the delightful with the grotesque to celebrate the cheeky side of girl power. Unable to flash their knickers for the sake of common decency, these charming improvisers will instead create their unique style of comedy by flashing cheeky characters, telling outrageous stories and sharing their off beat humour for the first time with New Zealand audiences. This will be their first international outing as a trio and they aren't about to let the Tasman Sea come between them and a tremendous opportunity to work with each other, grow their skills and charm the pants (knickers) off the Kiwis. "Beautiful ladies doing ugly things." Book your tickets now at Dash Tickets. Follow the latest from the ladies on their blog.